Advox members Marianne Diaz and Sarah Myers are reporting live from the NETmundial global Internet governance meeting taking place from April 23-24 in Sao Paulo, Brazil. Civil society, corporate, and government representatives from around the world have gathered to debate the future of Internet governance in a post-Snowden world. This post is part of series of features on the event. 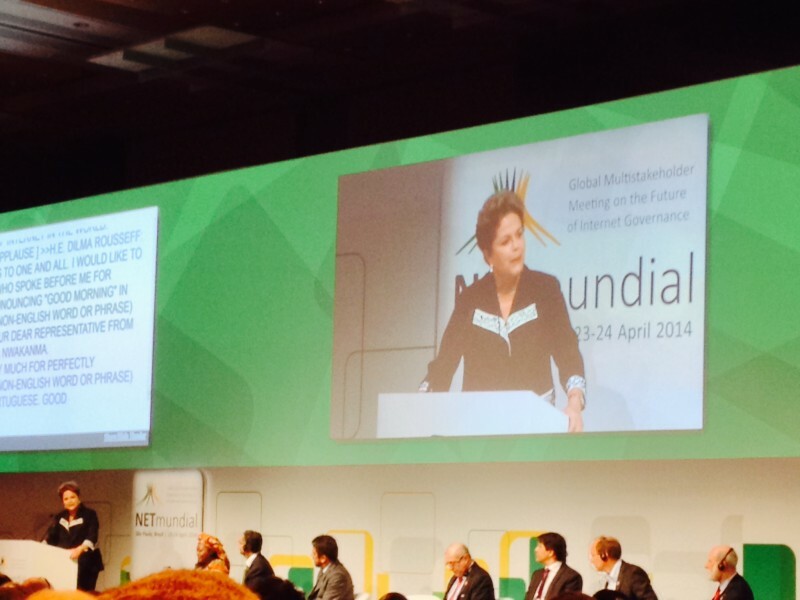 Dilma Rousseff addresses the crowd at NETmundial. Photo by Sarah Myers. The NETmundial meeting came to a close late in the evening on April 24 with the release of the all-too-appropriately titled Multistakeholder Statement of Sao Paulo. For members of civil society, the outcome was less a step forward for online rights than many had hoped. Provisions addressing net neutrality and the principle of proportionality were not included in the final version, and a section on intermediary liability lacked safeguards to protect due process and the rights to free expression and privacy. Language asserting the right to privacy and condemning unlawful surveillance was included, albeit without the direct reference to whistleblower Edward Snowden that some participants had proposed. Just one day ago, the meeting began with a series of thoughtful and high-energy remarks by open Internet leaders from around the world. Representing civil society, Nnenna Nwakanma called for trust to be reinstated at all levels in the discussion around Internet governance, which she said has been eroded by the collection, processing and interception of communications. Google's Vint Cerf focused his remarks on Internet governance organizations, arguing that ICANN should be made more transparent and accountable and that funding for the Internet Governance Forum be bolstered. Web inventor Tim Berners-Lee called for the adoption of net neutrality, and for freedom of expression to be considered a human right that must be coupled with the right to privacy. The discussion was punctuated by a number of interruptions by participants, who held up banners urging Rousseff to sign the Marco Civil (which she did on April 23) and protesting surveillance of Internet users. Some government representatives paid lip service to the concept, but then strongly asserted the role of the nation-state in their remarks – Abdullah Abdulaziz Aldarrab, Minister of Communications and Technology for Saudi Arabia, called the Internet “the right of governments,” while Vinay Kwatra, Deputy Secretary for India’s Ministry of Foreign Affairs, called the role of governments “an imperative that can’t be ignored” due to the expansion of roles traditionally associated with the state into the online space. On April 24, the day's activities revolved around the drafting of the meeting's outcome document, a process that generated significant controversy among participatnts. Rather than include a multiplicity of views in the document, the pre-selected high-level committee chose to develop a document that would approximate a “rough consensus” between the many parties involved. Participants were allowed to observe but not comment from inside the drafting room as members of the committee debated the provisions. Some have insinuated that corporate lobbyists had undue influence in the room, and that minimal civil society representation on the may have contributed to the weakened provisions. The committee included representatives from twelve government “hosts” of the event (Argentina, Brazil, France, Ghana, Germany, India, Indonesia, S. Africa, S. Korea, Tunisia, Turkey, US), and three representatives from each “stakeholder” community, including the corporate sector, academia, civil society, and the technical community. Participants hold anti-surveillance banner at NETmundial. Photo by Sarah Myers. When the text was finally presented to the audience, two hours behind schedule, it was largely met with silence from the exhausted participants along with some scattered applause following mentions of surveillance. The crowd offered a partial standing ovation in response to the Internet governance principles included in the document. Some government representatives, notably Cuba, India, and Russia, withheld support for the document, though each expressed admiration for the process. While disappointment over the outcome is very real, the remarks of a number of participants reflected the view that the meeting’s greatest achievement is that it happened at all. The diversity of representation and breadth of the process were remarkable, but also may have led to many leaving NETmundial without what they were looking for.